In typography and lettering, a sans-serif, sans serif, gothic, or simply sans letterform is one that does not have extending features called "serifs" at the end of strokes. 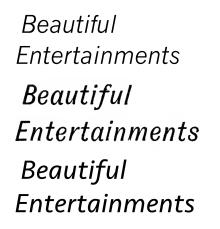 Sans-serif fonts tend to have less line width variation than serif fonts. In most print, they are often used for headings rather than for body text. They are often used to convey simplicity and modernity or minimalism. Sans-serif fonts have become the most prevalent for display of text on computer screens. On lower-resolution digital displays, fine details like serifs may disappear or appear too large. The term comes from the French word sans, meaning "without" and "serif" of uncertain origin, possibly from the Dutch word schreef meaning "line" or pen-stroke. Before the term "sans-serif" became common in English typography, a number of other terms had been used. One of these outmoded terms for sans serif was gothic, which is still used in East Asian typography and sometimes seen in font names like News Gothic, Highway Gothic, or Trade Gothic. Sans-serif fonts are sometimes, especially in older documents, used as a device for emphasis, due to their typically blacker type color. For the purposes of type classification, sans-serif designs are usually divided into three or four major groups, the fourth being the result of splitting the grotesque category into grotesque and neo-grotesque. This group features most of the early (19th century to early 20th) sans-serif designs. Influenced by Didone serif fonts of the period and signpainting traditions, these were often quite solid, bold designs suitable for headlines and advertisements. The early sans-serif typefaces often did not feature a lower case or italics, since they were not needed for such uses. They were sometimes released by width, with a range of widths from extended to normal to condensed, with each style different, meaning to modern eyes they can look quite irregular and eccentric. Grotesque fonts have limited variation of stroke width (often none perceptible in capitals). The terminals of curves are usually horizontal, and many have a spurred "G" and an "R" with a curled leg. Capitals tend to be of relatively uniform width. Cap height and ascender height are generally the same to create a more regular effect in texts such as titles with many capital letters, and descenders are often short for tighter linespacing. Most avoid having a true italic in favour of a more restrained oblique or sloped design, although at least sans-serif true italics were offered. Examples of grotesque fonts include Akzidenz Grotesk, Venus, News Gothic, Franklin Gothic and Monotype Grotesque. Akzidenz Grotesk Old Face, Knockout, Grotesque No. 9 and Monotype Grotesque are examples of digital fonts that retain more of eccentricities of some of the early sans-serif types. The term realist has also been applied to these designs due to their practicality and simplicity. Helvetica, originally released by Haas Type Foundry (as Neue Haas Grotesk) in 1957. A typical neo-grotesque. As the name implies, these modern designs consist of a direct evolution of grotesque types. They are relatively straightforward in appearance with limited width variation. Unlike earlier grotesque designs, many were issued in extremely large and versatile families from the time of release, making them easier to use for body text. Similar to grotesque typefaces, neogrotesques often feature capitals of uniform width and a quite 'folded-up' design, in which strokes (for example on the 'c') are curved all the way round to end on a perfect horizontal or vertical. Helvetica is an example of this. Others such as Univers are less regular. Neo-grotesque type began in the 1950s with the emergence of the International Typographic Style, or Swiss style. Its members looked at the clear lines of Akzidenz Grotesk (1896) as an inspiration to create rational, almost neutral typefaces. In 1957 the release of Helvetica, Univers, and Folio, the first typefaces categorized as neo-grotesque, had a strong impact internationally: Helvetica came to be the most used typeface for the following decades. Other, later neo-grotesques include Unica, Imago and Rail Alphabet, and in the digital period Acumin, San Francisco and Roboto. Futura, originally released by Bauer Type Foundry in 1927. A typical geometric sans serif. As their name suggests, Geometric sans-serif typefaces are based on geometric shapes, like near-perfect circles and squares. Common features are a nearly-exactly circular capital "O" and a "single-story" lowercase letter "a". The 'M' is often splayed and the capitals of varying width, following the classical model. Of these four categories, geometric fonts tend to be the least useful for body text and often used for headings and small passages of text. The geometric sans originated in Germany in the 1920s. Two early efforts in designing geometric types were made by Herbert Bayer and Jakob Erbar, who worked respectively on Universal Typeface (unreleased at the time but revived digitally as Architype Bayer) and Erbar (circa 1925). In 1927 Futura, by Paul Renner, was released to great acclaim and popularity. Geometric sans-serif fonts were popular from the 1920s and 1930s due to their clean, modern design, and many new geometric designs and revivals have been created since. [b] Notable geometric types of the period include Kabel, Semplicità, Nobel and Metro; more recent designs in the style include ITC Avant Garde, Brandon Grotesque, Gotham and Avenir. Many geometric sans-serif alphabets of the period, such as those created by the Bauhaus art school (1919-1933) and modernist poster artists, were hand-lettered and not cut into metal type at the time. A separate inspiration for many types considered "geometric" in design has been the simplified shapes of letters engraved or stenciled on metal and plastic in industrial use, which often follow a simplified structure and are sometimes known as "rectilinear" for their use of straight vertical and horizontal lines. Designs considered geometric in principles but which are less descended from the Futura/Erbar/Kabel tradition include Bank Gothic, DIN 1451, Eurostile and Handel Gothic, along with many of the fonts designed by Ray Larabie. Syntax, originally released by D. Stempel AG in 1969. A humanist sans serif. Humanist sans-serifs take inspiration from traditional letterforms, such as Roman square capitals, traditional serif fonts and calligraphy. Many have true italics rather than an oblique, ligatures and even swashes in italic. One of the earliest humanist designs was Edward Johnston's Johnston typeface of c. 1916, and, a decade later, Gill Sans (Eric Gill, 1928). Edward Johnston, a calligrapher by profession, was inspired by classic letter forms, especially the capital letters on the Column of Trajan. Humanist designs vary more than gothic or geometric designs. Some humanist designs have stroke modulation (strokes that clearly vary in width along their line) or alternating thick and thin strokes. These include most popularly Hermann Zapf's Optima (1958), a typeface expressly designed to be suitable for both display and body text. Some humanist designs may be more geometric, as in Gill Sans and Johnston (especially their capitals), which like Roman capitals are often based on perfect squares, half-squares and circles, with considerable variation in width. These somewhat architectural designs may feel too stiff for body text. Others such as Syntax, Goudy Sans and Sassoon Sans more resemble handwriting, serif fonts or calligraphy. Frutiger, from 1976, has been particularly influential in the development of the modern humanist sans genre, especially designs intended to be particularly legible above all other design considerations. The category expanded greatly during the 1980s and 1990s, partly as a reaction against the overwhelming popularity of Helvetica and Univers and also due to the need for legible fonts on low-resolution computer displays. Designs from this period intended for print use include FF Meta, Myriad, Thesis, Charlotte Sans, Bliss and Scala Sans, while designs created for computer use include Microsoft's Tahoma, Trebuchet, Verdana, Calibri and Corbel, as well as Lucida Grande, Fira Sans and Droid Sans. Humanist sans-serif designs can (if appropriately proportioned and spaced) be particularly suitable for use on screen or at distance, since their designs can be given wide apertures or separation between strokes, which is not a conventional feature on grotesque and neo-grotesque designs. Due to the diversity of sans-serif typefaces, many do not fit neatly into the above categories. For example, Neuzeit S has both neo-grotesque and geometric influences, as does Hermann Zapf's URW Grotesk. Other "trans-sans" designs include Whitney and Klavika. Sans-serif fonts intended for signage, such as Transport and Highway Gothic used on road signs, may have unusual features to enhance legibility and differentiate characters, such as a lower-case "L" with a curl or "i" with serif under the dot. A particular subgenre of sans-serifs is those such as Rothbury, Britannic, Radiant, and National Trust with obvious variation in stroke width. These have been called 'modulated' or 'stressed' sans-serifs. They are nowadays often placed within the humanist genre, although they predate Johnston which started the modern humanist genre. These may take inspiration from sources outside printing such as brush lettering or calligraphy. Letters without serifs have been common in writing across history, for example in casual, non-monumental epigraphy of the classical period. However, Roman square capitals, the inspiration for much Latin-alphabet lettering throughout history, had prominent serifs. While simple sans-serif letters have always been common in "uncultured" writing, such as basic handwriting, most artistically created letters in the Latin alphabet, both sculpted and printed, since the Middle Ages have been inspired by fine calligraphy, blackletter writing and Roman square capitals. As a result, printing done in the Latin alphabet for the first three hundred and fifty years of printing was "serif" in style, whether in blackletter, roman type, italic or occasionally script. The earliest printing typefaces which omitted serifs were not intended to render contemporary texts, but to represent inscriptions in Ancient Greek and Etruscan. Thus, Thomas Dempster's De Etruria regali libri VII (1723), used special types intended for the representation of Etruscan epigraphy, and in c. 1745, the Caslon foundry made Etruscan types for pamphlets written by Etruscan scholar John Swinton. Another niche used of a printed sans-serif letterform from in 1786 onwards was a rounded sans-serif script font developed by Valentin Haüy for the use of the blind to read with their fingers. An inscription at the neoclassical grotto at Stourhead in the west of England dated to around 1748, one of the first to use sans-serif letterforms since the classical period. [c] Unfortunately, the inscription was destroyed by mistake in 1967, and had to be replicated from historian James Mosley's photographs. 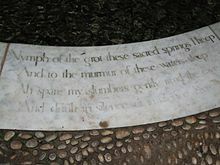 The corporate font of the National Trust of the United Kingdom, which manages Stourhead, was loosely designed by Paul Barnes based on the inscription. 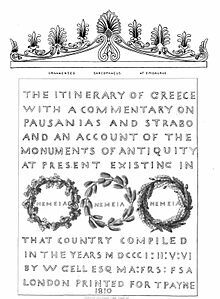 An early "neoclassical" use of sans-serif capitals to represent antiquity, drawn by William Gell for his 1810 book on Ancient Greek antiquities. Towards the end of the eighteenth century Neoclassicism led to architects increasingly incorporating ancient Greek and Roman designs in contemporary structures. The architect John Soane commonly used sans-serif letters on his drawings and architectural designs. Soane's inspiration was apparently the inscriptions dedicating the Temple of Vesta in Tivoli, Italy, with minimal serifs. These were then copied by other artists, and in London sans-serif capitals became popular for advertising, apparently because of the "astonishing" effect the unusual style had on the public. The lettering style apparently became referred to as "old Roman" or "Egyptian" characters, referencing the classical past and a contemporary interest in Ancient Egypt and its blocky, geometric architecture. The inappropriateness of the name was not lost on the poet Robert Southey, in his satirical Letters from England written in the character of a Spanish aristocrat. It commented: "The very shopboards must be... painted in Egyptian letters, which, as the Egyptians had no letters, you will doubtless conceive must be curious. They are simply the common characters, deprived of all beauty and all proportion by having all the strokes of equal thickness, so that those which should be thin look as if they had the elephantiasis." Similarly, the painter Joseph Farington wrote in his diary on September 13, 1805 of a memorial to Isaac Hawkins Browne in the chapel of Trinity College, Cambridge, engraved "in what is called Egyptian Characters which to my eye had a disagreeable effect." Around 1816, the Ordnance Survey began to use 'Egyptian' lettering, monoline sans-serif capitals, to mark ancient Roman sites. This lettering was printed from copper plate engraving. Specimen by William Caslon IV showing his Two Lines English Egyptian sans-serif, the first general-purpose "sans-serif" printing type ever. Cut in only one size, it was apparently not promoted with any prominence. Sample image of condensed sans-serifs from the Figgins foundry of London in an 1845 specimen-book. Much less influenced by classical models than the earliest sans-serif lettering, these faces became extremely popular for commercial use. Around 1816, William Caslon IV produced the first sans-serif printing type in England for the Latin alphabet, a capitals-only face under the title 'Two Lines English Egyptian', where 'Two Lines English' referred to the font's body size, which equals to about 28 points. No uses of it from the period have been found; Mosley speculates that it may have been commissioned by a specific client. 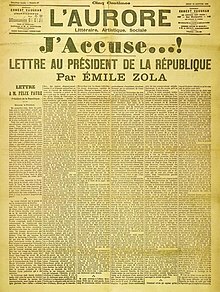 The January 13, 1898 edition of L'Aurore (the J'Accuse…! issue): An early example of sans-serif in the media. Select headlines as well as the journal's title are in a sans-serif typeface. Sans-serif lettering and fonts were popular due to their clarity and legibility at distance in advertising and display use, when printed very large or small. Because sans-serif type was often used for headings and commercial printing, many early sans-serif designs did not feature lower-case letters. Simple sans-serif capitals, without use of lower-case, became very common in uses such as tombstones of the Victorian period in Britain. The term "grotesque" became commonly used to describe sans-serifs. The term "grotesque" comes from the Italian word for cave, and was often used to describe Roman decorative styles found by excavation, but had long become applied in the modern sense for objects that appeared "malformed or monstrous." The first section of the avant-garde magazine Blast, published by Wyndham Lewis in 1914, used a condensed grotesque in order to give an impression of modernity and novelty. Sans-serif type in both upper- and lower-case on a 1914 poster. The first use of sans serif as a running text has been proposed to be the short booklet Feste des Lebens und der Kunst: eine Betrachtung des Theaters als höchsten Kultursymbols (Celebration of Life and Art: A Consideration of the Theater as the Highest Symbol of a Culture), by Peter Behrens, in 1900. Gill Sans on the nameplate of a 4468 Mallard locomotive (built in 1938). It was marketed as a sophisticated refinement of earlier sans-serifs, taking inspiration from Roman capitals and designer Eric Gill's experience carving monuments and memorials. Throughout the nineteenth and early twentieth centuries sans-serif types were viewed with suspicion by many printers, especially those of fine book printing, as being fit only for advertisements (if that), and to this day most books remain printed in serif fonts as body text. This impression would not have been helped by the standard of common sans-serif types of the period, many of which now seem somewhat lumpy and eccentrically-shaped. In 1922, master printer Daniel Berkeley Updike described sans-serif fonts as having "no place in any artistically respectable composing-room." By 1937 he stated that he saw no need to change this opinion in general, though he felt that Gill Sans and Futura were the best choices if sans-serifs had to be used. Through the early twentieth century, an increase in popularity of sans-serif fonts took place as more artistic sans-serif designs were released. While he disliked sans-serif fonts in general, the American printer J.L. Frazier wrote of Copperplate Gothic in 1925 that "a certain dignity of effect accompanies...due to the absence of anything in the way of frills," making it a popular choice for the stationery of professionals such as lawyers and doctors. As Updike's comments suggest, the new, more constructed humanist and geometric sans-serif designs were viewed as increasingly respectable, and were shrewdly marketed in Europe and America as embodying classic proportions (with influences of Roman capitals) while presenting a spare, modern image. Futura in particular was extensively marketed by Bauer and its American distribution arm by brochure as capturing the spirit of modernity, using the German slogan "die Schrift unserer Zeit" ("the typeface of our time") and in English "the typeface of today and tomorrow"; many typefaces were released under its influence as direct clones, or at least offered with alternate characters allowing them to imitate it if desired. 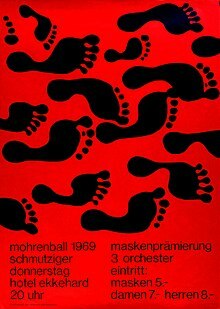 A 1969 poster exemplifying the trend of the 1950s and 60s: solid red colour, simplified images and the use of a grotesque face. This design, by Robert Geisser, appears to use Helvetica. In the post-war period, an increase of interest took place in "grotesque" sans-serifs. Writing in The Typography of Press Advertisement (1956), printer Kenneth Day commented that Stephenson Blake's eccentric Grotesque series had returned to popularity for having "a personality sometimes lacking in the condensed forms of the contemporary sans cuttings of the last thirty years." Leading type designer Adrian Frutiger wrote in 1961 on designing a new face, Univers, on the nineteenth-century model: "Some of these old sans serifs have had a real renaissance within the last twenty years, once the reaction of the 'New Objectivity' had been overcome. A purely geometrical form of type is unsustainable." Of this period in Britain, Mosley has commented that in 1960 "orders unexpectedly revived" for Monotype's eccentric Monotype Grotesque design: "[it] represents, even more evocatively than Univers, the fresh revolutionary breeze that began to blow through typography in the early sixties" and "its rather clumsy design seems to have been one of the chief attractions to iconoclastic designers tired of the...prettiness of Gill Sans". 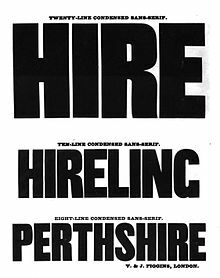 By the 1960s, neo-grotesque fonts such as Univers and Helvetica had become popular through reviving the nineteenth-century grotesques while offering a more unified range of styles than on previous designs, allowing a wider range of text to be set artistically through setting headings and body text in a single family. The style of design using asymmetric layouts, Helvetica and a grid layout extensively has been called the Swiss or International Typographic Style. Three sans-serif "italics". News Gothic has an oblique. [f] Gothic Italic no. 124, an 1890s grotesque, has a true italic resembling Didone serifs of the period. Seravek, a modern humanist font, has a more organic italic which is less folded-up. Egyptian: the name of Caslon's first general-purpose sans-serif printing type; also documented as being used by Joseph Farington to describe seeing the sans serif inscription on John Flaxman's memorial to Isaac Hawkins Brown in 1805, though today the term is commonly used to refer to slab serif, not sans serif. Antique: particularly popular in France; some families such as Antique Olive, still carry the name. Grotesque: popularised by William Thorowgood of Fann Street Foundry from around 1830. The name came from the Italian word 'grottesco', meaning 'belonging to the cave'. In Germany, the name became Grotesk. Gothic: popular with American type founders. Perhaps the first use of the term was due to the Boston Type and Stereotype Foundry, which in 1837 published a set of non-serifed typefaces under that name. It is believed that those were the first sans serif designs to be introduced in America. The term probably derived from the architectural definition, which is neither Greek nor Roman, and from the extended adjective term of "Germany", which was the place where sans-serif typefaces became popular in the 19th to 20th centuries. Early adopters for the term includes Miller & Richard (1863), J. & R. M. Wood (1865), Lothian, Conner, Bruce McKellar. Although the usage is now rare in the English-speaking world, the term is commonly used in Japan and South Korea; in China they are known by the term heiti (Chinese: 黑體), literally meaning "black type", which is probably derived from the mistranslation of Gothic as blackletter typeface, even though actual blackletter fonts have serifs. Lineale, or linear: The term was defined by Maximilien Vox in the VOX-ATypI classification to describe sans-serif types. Later, in British Standards Classification of Typefaces (BS 2961:1967), lineale replaced sans-serif as classification name. Simplices: In Jean Alessandrini's désignations préliminaries (preliminary designations), simplices (plain typefaces) is used to describe sans-serif on the basis that the name 'lineal' refers to lines, whereas, in reality, all typefaces are made of lines, including those that are not lineals. Swiss: It is used as a synonym to sans-serif, as opposed to roman (serif). The OpenDocument format (ISO/IEC 26300:2006) and Rich Text Format can use it to specify the sans-serif generic font family name for a font used in a document. Presumably refers to the popularity of sans-serif grotesque and neo-grotesque types in Switzerland. Industrial: used to refer to grotesque and neo-grotesque sans-serifs, that unlike humanist, geometric and decorative designs are not based on "artistic" principles. This gallery presents images of sans-serif lettering and type across different times and places from early to recent. Particular attention is given to unusual uses and more obscure fonts, meaning this gallery should not be considered a representative sampling. Dublin 1848, capitals-only heading. Reasonably conventional except for the crossed V-form 'W'. Small art-noveau flourishes on the 'v' and 'e'. Ljubljana, 1916. A nearly monoline sans combined with a stroke-modulated sans used for the title. Austrian war bond poster, 1916. Broad block capitals. Hungarian film poster, 1918. Monoline sans-serif with art-nouveau influences visible in the tilted 'e' and 'a'. Note embedded umlaut at top left for tighter linespacing. Art Deco thick block inline sans-serif capitals, with inner details kept very thin. France, 1920s. Berthold Block, a thick German sans-serif with shortened descenders, allowing tight linespacing. Switzerland, 1928. Artistic sans-serif keeping curves to a minimum (the line 'O Governo do Estado'), Brazil, 1930. Lightly modulated sans serif lettering on a 1930s poster, pointed stroke endings suggesting a brush. Classic geometric sans-serif capitals, with points on the capital 'A' and 'N'. Australia, 1934. Dwiggins' Metrolite and Metroblack fonts, geometric types of the style popular in the 1930s. A 1940s American poster. The curve of the 'r' is a common feature in grotesque fonts, but the 'single-story' 'a' is a classic feature of geometric fonts from the 1920s onwards. 1952 Jersey holiday events brochure, using the popular Gill Sans-led British style of the period. Swiss-style poster using Helvetica, 1964. Tight spacing characteristic of the period. Ultra-condensed industrial sans-serif in the style of the 1960s; Berlin 1966. Neo-grotesque type, 1972, Switzerland: Helvetica or a close copy. The irregular baseline may be due to using transfers. Tightly-spaced ITC Avant Garde; 1976. 1997 film festival poster, Ankara. Distorted sans-serif in the "grunge typography" style, Ankara 2002. ^ The original metal type of Akzidenz-Grotesk did not have an oblique; this was added in the 1950s, although many sans-serif obliques of the period are similar. ^ In this period and since, some sources have distinguished the nineteenth-century "grotesque/gothic" designs from the "sans-serifs" (those now categorised as humanist and geometric both) of the twentieth, or used some form of classification that emphasises a different between the groups. ^ Mosley's book on early sans-serifs The Nymph and the Grot is named for the sculpture. The name is a dual reference, also to "grotesque" being coincidentally a term also applied to early sans-serif fonts, although Mosley suggests that the design does not seem to be a direct source of modern sans-serifs. ^ Apparently based on traditions in his industry, master sign-painter James Callingham writes in his textbook "Sign Writing and Glass Embossing" (1871) that "What one calls San-serif, another describes as grotesque; what is generally known as Egyptian, is some times called Antique, though it is difficult to say why, seeing that the letters so designated do not date farther back than the close of the last century. Egyptian is perhaps as good a term as could be given to the letters bearing that name, the blocks being characteristic of the Egyptian style of architecture. These letters were first used by sign-writers at the close of the last century, and were not introduced in printing till about twenty years later. Sign-writers were content to call them “block letters,” and they are sometimes so-called at the present day; but on their being taken in hand by the type founders, they were appropriately named Egyptian. The credit of having introduced the ordinary square or san-serif letters also belongs to the sign-writer, by whom they were employed half a century before the type founder gave them his attention, which was about the year 1810." ^ A few theories about early sans-serifs now known to be incorrect may be mentioned here. One is that sans-serifs are based on either "fat face typefaces" or slab-serifs with the serifs removed. It is now known that the inspiration was more classical antiquity, and sans-serifs appeared before the first dated appearance of slab-serif letterforms in 1810. A hint of the "classical" inspiration of sans-serifs is the fact that they for a long time only appeared as capitals without a lower-case. The Schelter & Giesecke foundry also claimed during the 1920s to have been offering a sans-serif with lower-case by 1825. Mosley describes this as "thoroughly discredited" and Walter Tracy describes the claimed date as "forty years too early"; Wolfgang Homola dates it to 1882 based on a study of Schelter & Giesecke specimens. ^ News Gothic's oblique was actually designed later than the original design, although many nineteenth-century sans-serifs are similar. ^ "sans serif" in The New Encyclopædia Britannica. Chicago: Encyclopædia Britannica Inc., 15th edn., 1992, Vol. 10, p. 421. ^ Childers; Griscti; Leben (January 2013). "25 Systems for Classifying Typography: A Study in Naming Frequency" (PDF). The Parsons Journal for Information Mapping. The Parsons Institute for Information Mapping. 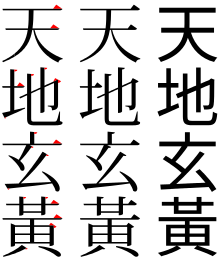 V (1). Retrieved 23 May 2014. Grotesque: Lineale typefaces with 19th-century origins. There is some contrast in thickness of strokes. They have squareness of curve, and curling close-set jaws. The R usually has a curled leg and the G is spurred. The ends of the curved strokes are usually oblique. Examples include the Stephenson Blake Grotesques, Condensed Sans No. 7, Monotype Headline Bold. Neo-grotesque: Lineale typefaces derived from the grotesque. They have less stroke contrast and are more regular in design. The jaws are more open than in the true grotesque and the g is often open-tailed. The ends of the curved strokes are usually horizontal. Examples include Edel/Wotan, Univers, Helvetica. Humanist: Lineale typefaces based on the proportions of inscriptional Roman capitals and Humanist or Garalde lower-case, rather than on early grotesques. They have some stroke contrast, with two-storey a and g. Examples include Optima, Gill Sans, Pascal. Geometric: Lineale typefaces constructed on simple geometric shapes, circle or rectangle. Usually monoline, and often with single-storey a. Examples include Futura, Erbar, Eurostile. ^ a b Shinn, Nick. "Uniformity" (PDF). Nick Shinn. Graphic Exchange. Retrieved 1 July 2015. ^ a b c Berry, John. "A Neo-Grotesque Heritage". Adobe Systems. Retrieved 15 October 2015. ^ a b Specimens of type, borders, ornaments, brass rules and cuts, etc. : catalogue of printing machinery and materials, wood goods, etc. American Type Founders Company. 1897. p. 340. Retrieved 17 August 2015. ^ "Italic Gothic". Fonts in Use. Retrieved 25 February 2017. ^ Hoefler & Frere-Jones. "Knockout". Hoefler & Frere-Jones. Retrieved 1 July 2015. ^ Hoefler & Frere-Jones. "Knockout sizes". Hoefler & Frere-Jones. ^ "Knockout styles". Hoefler & Frere-Jones. Retrieved 1 July 2015. ^ Lippa, Domenic. "10 favourite fonts". The Guardian. Retrieved 1 July 2015. ^ Meggs 2011, pp. 376-377. ^ Adi Kusrianto. Pengantar Tipografi. Elex Media Komputindo. p. 66. ISBN 978-979-27-8132-8. ^ Lagerkvist, Love. "American Football". Fonts In Use. Retrieved 18 June 2017. Imago [is] a relatively obscure neo-grotesk released by Berthold in the early ’80s. ^ Slimbach, Robert. "Using Acumin". Acumin microsite. Adobe Systems. Retrieved 6 January 2016. ^ Coles, Stephen. "New Additions: November 2015". Identifont. Retrieved 8 January 2016. ^ "Fontshop lists: Neo-grotesque". FontShop. Retrieved 18 June 2017. ^ Ulrich, Ferdinand. "A short intro to the geometric sans". FontShop. Retrieved 17 December 2016. ^ Ulrich, Ferdinand. "Types of their time – A short history of the geometric sans". FontShop. Retrieved 19 August 2015. ^ Kupferschmid, Indra. "On Erbar and Early Geometric Sans Serifs". CJ Type. Retrieved 20 October 2016. ^ Meggs 2011, pp. 339-340. ^ a b Day, Kenneth (1956). The Typography of Press Advertisement. pp. 86–8. ^ Kupferschmid, Indra. "True Type of the Bauhaus". Fonts in Use. Retrieved 15 October 2016. ^ Tselentis, Jason (August 28, 2017). "Typodermic's Raymond Larabie Talks Type, Technology & Science Fiction". How. Retrieved October 29, 2017. ^ Kupferschmid, Indra. "Some type genres explained". kupferschrift (blog). Retrieved 31 October 2017. ^ a b Tracy 1986, pp. 86-90. ^ Nash, John. "In Defence of the Roman Letter" (PDF). Journal of the Edward Johnston Foundation. Retrieved 13 October 2016. ^ Blackwell, written by Lewis (2004). 20th-century type (Rev. ed.). London: Laurence King. p. 201. ISBN 9781856693516. ^ Lawson 1990, pp. 326-330. ^ Berry, John D. "Not Your Father's Sans Serif". Creative Pro. Retrieved 24 February 2019. ^ Berry, John D. "The Human Side of Sans Serif". Creative Pro. Retrieved 24 February 2019. ^ Coles, Stephen. "Questioning Gill Sans". Typographica. Retrieved 18 December 2015. ^ Kupferschmid, Indra. "Gill Sans Alternatives". Kupferschrift. Retrieved 23 February 2019. ^ Calvert, Margaret. "New Transport". A2-TYPE. Retrieved 2 May 2016. ^ Coles, Stephen. "Identifont blog Feb 15". Identifont. Retrieved 17 August 2015. ^ "Perkins School for the Blind". Perkins School for the Blind. Retrieved 15 October 2016. ^ Johnston, Alastair. "Robert Grabhorn Collection on the History of Printing". San Francisco Public Library. Retrieved 15 October 2016. ^ a b c d e f g h Mosley, James (1999). The Nymph and the Grot: the Revival of the Sanserif Letter. London: Friends of the St Bride Printing Library. pp. 1–19. ISBN 9780953520107. ^ John L Walters (2 September 2013). Fifty Typefaces That Changed the World: Design Museum Fifty. Octopus. pp. 1913–5. ISBN 978-1-84091-649-2. ^ Barnes, Paul. "James Mosley: A Life in Objects". Eye. Retrieved 23 September 2016. ^ Gell, William (1810). The Itinerary of Greece. London. Retrieved 8 March 2019. ^ Alexander Nesbitt (1998). The History and Technique of Lettering. Courier Corporation. p. 160. ISBN 978-0-486-40281-9. ^ "L. Y.". "To the Editor of the European Magazine". European Magazine. Retrieved 15 October 2016. ^ Callingham, James (1871). Sign Writing and Glass Embossing. pp. 54–55. ^ L. Parramore (13 October 2008). Reading the Sphinx: Ancient Egypt in Nineteenth-Century Literary Culture. Springer. pp. 22–3. ISBN 978-0-230-61570-0. ^ Jason Thompson (30 April 2015). Wonderful Things: A History of Egyptology 1: From Antiquity to 1881. The American University in Cairo Press. pp. 251–2. ISBN 978-977-416-599-3. ^ Southey, Robert (1808). Letters from England: by Don Manual Alvarez Espriella. pp. 274–5. ^ Farington, Joseph; Greig, James (1924). The Farington Diary, Volume III, 1804-1806. London: Hutchinson & Co. p. 109. Retrieved 15 October 2016. ^ Caslon, William. [Specimens of printing types] (untitled specimen book). London: William Caslon IV. Retrieved 6 March 2019. ^ Specimen of Plain & Ornamental Types from the Foundry of V. & J. Figgins. London: V. & J. Figgins Letterfounders. 1846. Retrieved 16 October 2016. ^ Tracy, Walter (2003). Letters of credit : a view of type design. Boston: David R. Godine. ISBN 9781567922400. ^ Simon Loxley (12 June 2006). Type: The Secret History of Letters. I.B.Tauris. pp. 36–8. ISBN 978-1-84511-028-4. ^ a b Mosley, James; Shinn, Nick. "Two Lines English Egyptian (comments on forum)". Typophile. Retrieved 30 October 2017. [T]he Figgins ‘Sans-serif’ types (so called) are well worth looking at. In fact it might be said to be that with these types the Figgins typefoundry brought the design into typography, since the original Caslon Egyptian appeared only briefly in a specimen and has never been seen in commercial use. One size of the Figgins Sans-serif appears in a specimen dated 1828 (the unique known copy is in the University Library, Amsterdam).…It is a self-confident design, which in the larger sizes abandons the monoline structure of the Caslon letter for a thick-thin modulation which would remain a standard model through the 19th century, and can still be seen in the ATF Franklin Gothic. Note that there is no lower-case. That would come, after 1830, with the innovative condensed ‘Grotesque’ of the Thorowgood foundry, which provided a model for type that would get large sizes into the lines of posters. It gave an alternative name to the design, and both the new features – the condensed proportions and the addition of lower-case – broke the link with Roman inscriptional capitals…But the antiquarian associations of the design were still there, at least in the smaller sizes, as the specimen of the Pearl size (four and three quarters points) of Figgins’s type shows. It uses the text of the Latin inscription prepared for the rebuilt London Bridge, which was opened on 1 August 1831. ^ Morlighem, Sebastien (September 30, 2016). Nineteenth-century sans serif typefaces in France (PDF) (Speech). The Song of the Sans-serif. Birmingham City University. ^ Meggs 2011, p. 155. ^ Handover, Phyllis Margaret (1958). "Grotesque Letters". Monotype Newsletter, also printed in Motif as "Letters without Serifs". ^ Lawson, Alexander S., Anatomy of a Typeface, David R. Godine, Publisher, Boston, Massachusetts, 1990, ISBN 0-87923-333-8, p. 296. ^ Handbuch der Schriftarten. Leipzig: Seeman. 1926. ^ Meggs 2011, p. 242. ^ "Promotional Poster, 1928". Red List. Monotype. ^ Updike, Daniel Berkeley (1922). Printing types : their history, forms, and use; a study in survivals vol 2 (1st ed.). Cambridge, MA: Harvard University Press. p. 243. Retrieved 17 August 2015. ^ Lawson, Alexander (1990). Anatomy of a typeface (1st ed.). Boston: Godine. p. 330. ISBN 9780879233334. ^ Frazier, J.L. (1925). Type Lore. Chicago. p. 20. Retrieved 24 August 2015. ^ "Fifty Years of Typecutting" (PDF). Monotype Recorder. 39 (2): 11, 21. 1950. Retrieved 12 July 2015. ^ "Gill Sans Promotional Poster, 1928". Red List. Monotype. ^ Horn, Frederick A. (1936). "Type Tactics No. 2: Grotesques: The Sans Serif Vogue". Commercial Art. 20 (132–135): http://magazines.iaddb.org/issue/CAI/1936-04-01/edition/null/page/18. ^ Rhatigan, Dan. "Futura: The Typeface of Today and Tomorrow". Ultrasparky. Retrieved 21 January 2018. ^ Aynsley, Jeremy (2000). Graphic Design in Germany: 1890-1945. Berkeley: University of California Press. pp. 102–5. ISBN 9780520227965. ^ Paul Shaw (April 2017). Revival Type: Digital Typefaces Inspired by the Past. Yale University Press. pp. 210–3. ISBN 978-0-300-21929-6. ^ Shaw, Paul. "From the Archives: Typographic Sanity". Paul Shaw Letter Design. Retrieved 26 December 2015. ^ Gerstner, Karl (1963). "A new basis for the old Akzidenz-Grotesk (English translation)" (PDF). Der Druckspiegel. Archived from the original (PDF) on 2017-10-15. Retrieved 15 October 2017. ^ Brideau, K.; Berret, C. (16 December 2014). "A Brief Introduction to Impact: 'The Meme Font'". Journal of Visual Culture. 13 (3): 307–313. doi:10.1177/1470412914544515. ^ Frutiger, Adrian (2014). Typefaces: The Complete Works. p. 88. ISBN 9783038212607. ^ Mosley, James (1999). The Nymph and the Grot. London. p. 9. ^ "Neue Haas Grotesk". History. The Font Bureau, Inc.
^ Lawson 1990, p. 296. ^ Lawson 1990, p. 295. ^ Haralambous 2007, p. 411. ^ Tracy, Walter. Letters of Credit. p. 98. ^ Handover, Phyllis Margaret. "Grotesque letters : a history of unseriffed type faces from 1816 to the present day". OCLC 30233885.